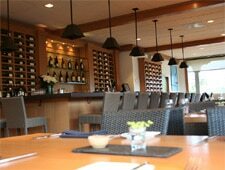 Californian chef Paul Shoemaker has revisited French bistro fare in this chic and casual Malibu dining spot. : We last experienced Paul Shoemaker's cuisine at Joe Pytka's restaurant, Bastide. Pytka had discovered the chef when Shoemaker was working at Providence. A California native, Shoemaker is at ease in his Malibu restaurant. Living a few blocks away, he is very familiar with the local growers from whom he buys most of the produce he uses. 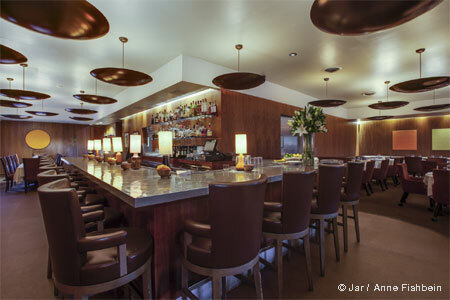 He has successfully revisited French bistro fare, giving it a modern California twist. The menu is short, well priced (the most expensive dish is $16) and ever-changing, according to the market. But let’s hope Shoemaker keeps the crab cakes, some of the best we've had. They were very light, not compact as we usually experience them. Continue with the apple salad, topped with blue cheese and candied walnuts; the seared octopus served with cucumber and lemon; or the farro, mixed with Parmesan and Swiss chard and topped by a poached egg. Skip the baby broccolini for the seared albacore in a light sauce seasoned with leeks, capers and lemon, or the hanger steak on a bed of pea tendrils. The duck confit is a must. There is a huge hamburger, called the Juicy Blucy, where the dry-aged beef is stuffed with blue cheese; it’s served with french fries so good you cannot stop eating them. Finish with the delicious chocolate-brioche bread pudding or the blueberry cheesecake. When it comes to wine, you have two options: the regular wine list or the Reserve wines, where California and France are the most represented. On the first list you will also find some unusual beers, like Deus, Brut des Flandres ($70). From the second list, you can celebrate with a 1969 Dom Pérignon at $1,200 or a 2005 Château Lafite Rothschild at $2,100. Every Tuesday from 5:30 p.m.-9 p.m., all bottles of wine are half price (Reserve list excluded). To make you feel comfortable and ensure a good feng shui in his chic bistro, done in blond wood tones, Shoemaker had a blessing ceremony by the Chumash Indians when it opened. Savory is a great dining option, and, as we know, the city of Malibu is deprived of restaurants, which makes the trip even better.